Horsey Days are Here Again! Busy, horsey days are upon me again! 10am Monday; the dogs were walked, the washing machine was groaning away on overtime (we just got a washing machine after two weeks without one, so there is a huge backlog to clear) and it was time to head up to the horses. 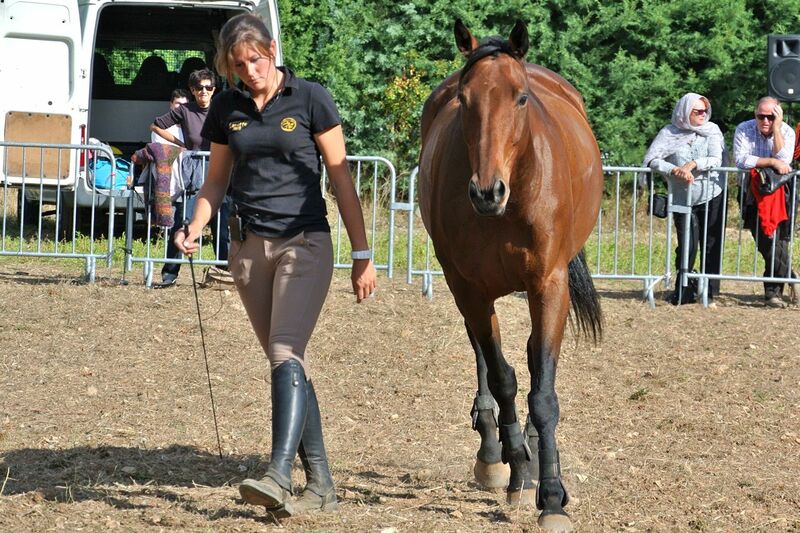 I had a lesson arranged with Alexandrine and my intention was to do travail au sol, groundwork, with Aero. I had another fairly gruelling session with the osteopath on Saturday so I’m being very cautious with my back and I had decided not to ride for another day at least. I had some pleasant grooming time with Aero, chopped about five inches off his tail and pulled his mane a little. He’s already grown a thick coat, as has Flurry, which is making me wonder just what sort of a winter we’re in for. I was a big fan of Monty Roberts back in the early 1990s, when I was lucky enough to see him do a couple of demos in a small riding school in West Cork. I was blown away with the whole Join-up/Follow-up thing, but I subsequently came to the conclusion that his method doesn’t do anything that sensible, consistent handling does. As a result, I never really bought into his methods (the commerciality of it all struck me, even back then), although I adopted a lot of his body language doctrine, in my own posture and in ‘reading’ my horses. I like to read about other Natural Horsemanship people, I’m just interested to learn what other people are doing, I guess. Mind you, I’ve never been a Parelli fan (even before certain videos starting appearing on YouTube) – I always found the notion of seven games just too contrived for my liking. 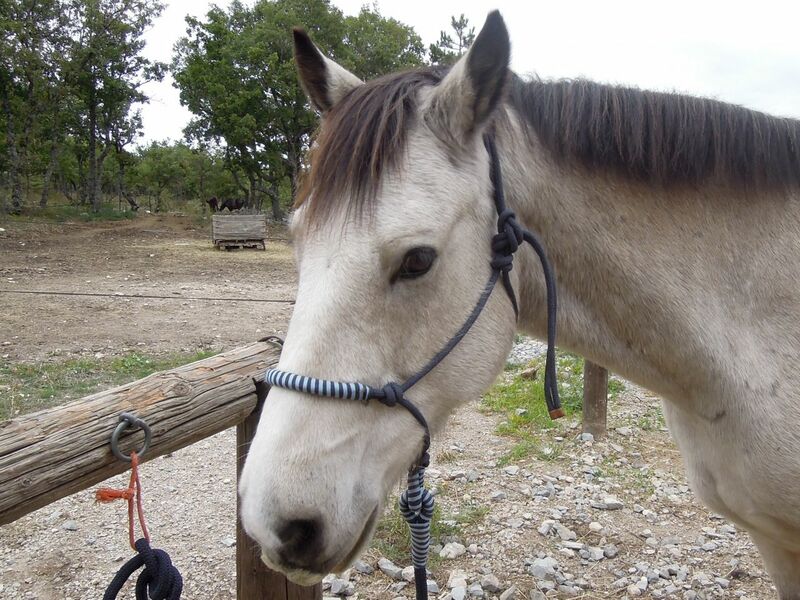 Alexandrine is big into Natural Horsemanship – equitation éthologique. She has trained Max, an ex-racehorse, for the last four years, and this year qualified for the French national championships with him, coming 6th in their section. 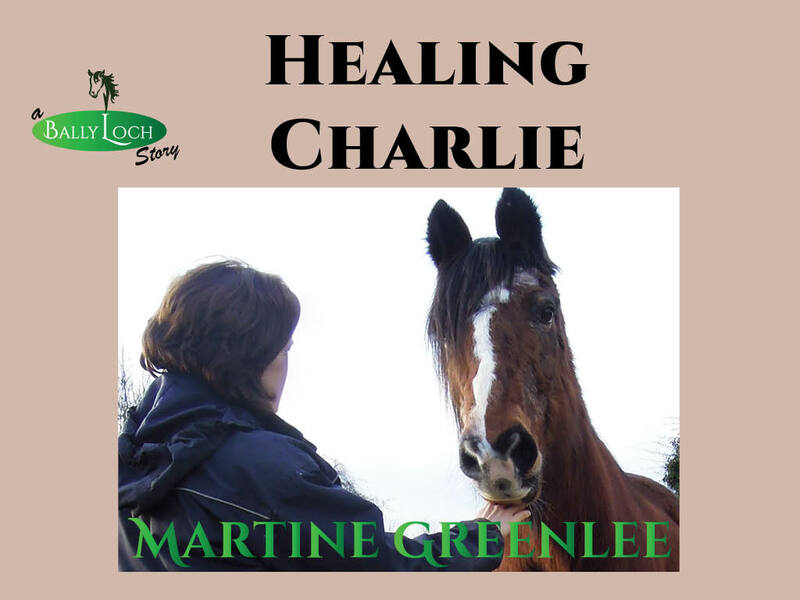 My one worry was – would she be pushing me towards a Parelli approach? Phew! I needn’t have worried! There were no games involved! The very first thing was simply getting the horse’s attention – move his hindquarters around so that he faces the handler. After that we worked on sending Aero off on a circle and using my body language to speed him up or slow him down (not a problem, we’ve been doing that for years), then we worked on him following me – going forwards as well as backwards. I used the stick (a dressage schooling whip) to signal to him to go forward, and he was really quick to pick up on the cues – all I had to do was lift it behind me and he would speed up. Slowing down was a little trickier. If he didn’t pick up on my body language, I was to block him with the stick. He ran through it a couple of times, but we eventually figured that out, too. There was plenty to take on board, and I found juggling the stick and lead rope complicated but I’m sure I’ll get used to it quickly. Aero, for his part, actually sweated up a bit – that’s what a big furry coat will do to you in 18°C! The vet was due for the flu booster shots in the afternoon. I went home for lunch and to look after the dogs, then I went up to the farm a little early and brought Flurry in for some attention. First of all I fitted the rope halter I bought last year in LeClerc. It’s generously sized and doesn’t have much room for adjustment but it fits his un-dainty head just fine. I gave him a good brushing, pulled his main, shortened his tail and trimmed his ears; then chatted with some of the others who were also waiting for the vet. Eventually, he came (they run late here, too) vaccinations and wormers were administered and I went back home, after the horsiest day in a long, long time! The following day, I decided to practise what I had learned with Aero on Flurry. I thought it would be a piece of cake but, I have to say, it showed up a few holes in our relationship. moving hindquarters around – no problem. moving front end around – no problem. sending him off an a circle – a bit panicky, not too sure why. asking him go faster (trot) using my body – I lifted the whip hand and WHAM! major explosion, leaping away with a double-barelled blast in my direction as he went. Ok, I sent him on for a few laps and then invited him to walk, which he did. Asked him to trot again – same reaction. We repeated several times, with me toning down my request significantly – basically all I had to do was square my shoulders and fix my eyes on him and he would trot. Lifting the whip hand resulted in an explosion, every time. The problem is, that when I give a very subtle signal, he trots – he’s obedient – but it’s lacklustre. It’s a sort of begrudging obedience. If I push him, looking for more activity, that’s when he has a tantrum. And that, I think, defines our relationship. He gives me what I ask for – barely. If I look for MORE or BETTER he starts to evade me if I’m riding or, as I learned today, has a tantrum if I’m on the ground. I proceeded to asking him to step backwards. What I was supposed to do was stand beside him, facing forward, my shoulder level with his cheek, and shake the lead-rope, while indicating “Back” with my body. If shaking the lead-rope had no effect (it didn’t) I was supposed to tap him smartly in the chest with the schooling whip. shake-shake-Shake-SHAKE-SHAKE–SHAKE-SHAKEDAMNYOU- tap! He leaped violently to the side. Well, that wasn’t the reaction I wanted, so we did it again. This time he leaped to the side and plunged forward. Ok, I thought, I’ll line him up by the arena fence so he can’t swing to the right and I’ll block him on the left. Can you guess what happened? Yeah, he barged right through me and the schooling whip like we weren’t there. Another gaping hole in our relationship – I don’t know what made him think that would ever be acceptable! Eventually I fudged it, so that he did indeed go backwards, but I had to face him, shake the lead-rope, step towards him and reinforce with the whip a few times. Next exercise was to have him follow me going forwards. Easy-peasy, I thought. He leads no bother. Well, yes except I have to drag him sometimes, so I should have anticipated problems. He totally ignored my body signals (slight tilt forward, energy level up, walking faster) and took no notice of me raising the stick, until eventually I had to resort to tapping him with it. That resulted in him swinging away sideways again. I resorted to using the arena fence to block him once again and we had a couple of good efforts. I could speed up and slow down and he matched my pace, so we finished on that note. And then I decided to ride him. No, nothing untoward happened, but he was being fussy with his head and falling in through the inside shoulder – evasion tactics. I really insisted on activity and inside bend – hard work for both of us! He had sweated up a lot by the time we finished – so had I, come to think of it! The verdict after all this? I need to get on Flurry’s case, as the Americans say. I need to demand reactivity, respect and obedience all the time. I need to practise the ground work exercises again and I’ll almost certainly need advice from Alexandrine. Dear horse: Please know that I’m all about kindness & gentleness & raining down hellfire if I feel your teeth on my person. Awesome post, I was so excited to see the title show up in Feedly! I’m also definitely not a NH practitioner – the resistance-free approach is good, but it doesn’t preach enough respect for this really large not very bright animal for me, and I’ve seen too many well-intentioned people get hurt doing it. I think you’re on the right track with getting on his case – he knows just what to do to make you quit, and if you get past that, you’ll be in great shape. I am not a fan of the Parelli or other NH commercialization. I feel that most NH is just common sense and I don’t need to spend a ton of money to buy their special equipment. Also, I have not witnessed but heard from others who have, about the nasty side of some of those trainers at clinics or demos. Not cool. …and Monty never came back to Cork!! Phew! I am not the only person then who has not jumped on the Parelli/Roberts bandwagon! Far too commercial and I saw a nasty or two behind the scenes of one of Monty’s demos that made a mockery of his whole ‘I am a horse whisperer’ façade. I figured out join-up after trying to catch a naughty horse as a kid. After an hour of ‘come to mummy’ with a bucket and a strained smile, I threw the bucket at the departing quarters, threw my hinds in the air and then sat down and had a weep – only to find the little sod leaning over me as if to say ‘did you want me? !’ Sigh!